Organizations and humans are an interesting mix. The needs of an organization do not always coexist with the needs of the human beings who work within that organization. Continuous Quality Improvement (CQI) efforts attempt to successfully channel human potential to enhance organizational results. Many leaders in today’s organizations are faced with how to appropriately blend this seemingly opposite need base. We have found that organizations have a low tolerance for delay and exist to produce routine, rational, planned, logical, highly predictable events. However, this is not true of why all human beings exist or work in an organization. Human beings have different and very important personal needs. People tend to be emotional, spontaneous, moody, sometimes illogical, and they also do not always like routine. In fact, people often become bored with the concept and implementation of routines. What becomes challenging is how to help human beings work in an inspired, motivated way toward an organizational effort. We have found it becomes critically important to establish what success is for the organization and then develop human potential towards the targets for success. If you try to develop the individual success for all the employees and then attempt to tie those together to a championship season for the organization, you may experience many problems. Specifically, we are saying that you must first define how the organization is to be successful and then tie individual performance to that organization’s success. This can be done by establishing specific targets or indicators of what a championship season for the organization would be. This may include goals such as revenue, quality, cost, customer satisfaction and marketing. It also includes many other dimensions of success that are measurably specific to the organization’s purpose, vision and mission. In order to have the opportunity for achieving "smooth operations" the organizational need and the human need must become more aligned toward a common purpose to have a chance to affect the necessary changes which will guide the organization toward concern for the organization to "rally" together to accomplish. This keeps us from having a number of inside enemies, blame, guilt or the pointing of fingers. When every individual working in the organization understands clearly not only the vision, mission and purpose of the organization, but also what the indicators or targets for success are, then there is purposeful and focused activity. Purposeful and focused activity is achieved when people can receive constant feedback on how they are doing as an organization in accomplishing the organizational indicators or targets. As you study the following four quadrants, you can see the purpose of an organization is achieved first by accomplishing the upper left quadrant which relates to highly predictable, low-delayed events. This becomes the definition of "smooth" or "planned" and are the reasons the other three quadrants exist. 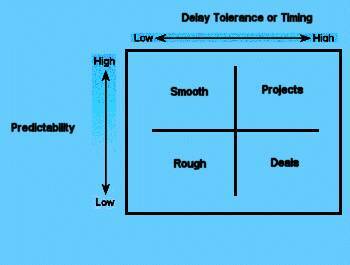 The three remaining quadrants support the efforts of individuals toward moving issues, concerns or events back to the highly predictable, low-delayed area or enhancing the current highly predictable, low-delayed events. The accomplishment of this effort would be called, in our terminology, "Smoother Operations". An organization that is effective in developing a focused environment realizes how human beings spend their time and that they have needs, wants and desires that need to be met. This is the area where Continuous Quality Improvement (CQI) efforts fail. They neglect to tie the overall organizational purpose to specific, meaningful end measurements, targets or indicators. The result is it doesn’t allow the development of appropriate empowered action teams to be working on activities that will enhance the ability to achieve a championship season. First define the indicators or targets for organizational success which can bring about the championship season. Then, you will have a great opportunity to empower, motivate and develop employees. This is where reward ties to organizational purpose. We specifically indicate to organizations that they should reward individual performance only after organizational success has been accomplished. This effort may have to be phased in due to the current organizational, cultural or specific compensation/reward processes. But, we believe it is important to move in that direction once you have sent a clear message that we will be successful as an organization first and then we will recognize the appropriate individual contributions. This philosophy sends a clear message to people about purpose and focus. This allows people to get off of "whose job it is", "whose fault it is", "who didn’t do something", "who did the wrong thing" and allows all to develop motivated and empowered action teams. When people want to participate in action teams because they understand the purpose and focus of a championship season, then you have people that are willing to do whatever it takes to accomplish success in the organization. This produces a great amount of initiated behavior which is the true core of any type of CQI effort. If you can’t set this process in motion, you become susceptible to the failures of many other teams which have developed individual performance incentives or job descriptions for specialized players where rewards are based upon "individual" performance. This leads to many individual accomplishments by members of the team but it may not lead to a championship season for the organization. In fact, we have seen many times in sports, or actual organizational behavior, where there are many dysfunctional team interrelations because the individual performance is recognized as more important than the organization’s success. In summary, achieving "smooth operations" occurs when the individuals that are important to an organization understand the purpose and mission of that organization. Once they understand the targets or successes that can be accomplished and the highly predictable, low-delayed events that need to happen for the business, you have an opportunity to be communicate and direct the organization’s efforts toward the championship. You can also enhance the effort to meet individual’s needs to have purposeful, focused work to accomplish. If you’re interested in implementing a Continuous Quality Improvement program in your organization, click here.